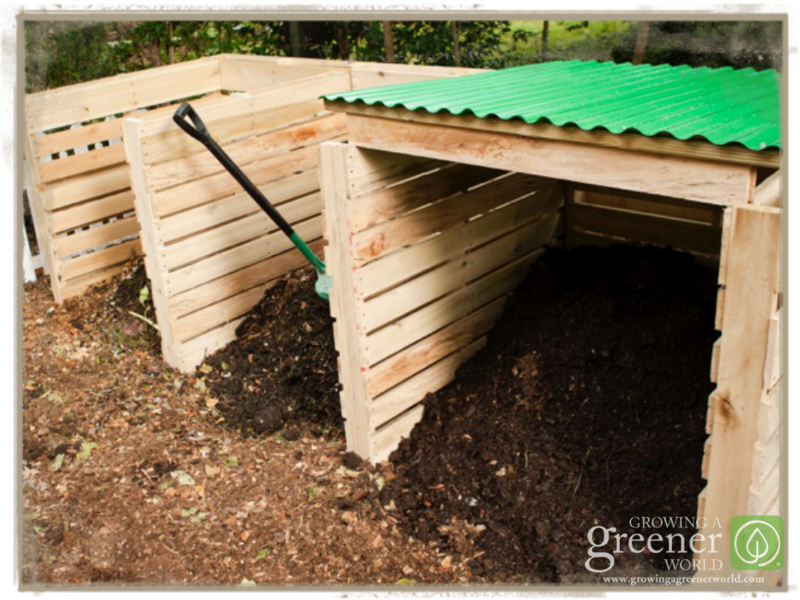 Building a composting bin using pallets is an incredibly easy project and a great use for these common items. Here’s what you need to know to build your own. Also be aware that pallets from one manufacturer to another are not always uniform in size. For this system, it’s preferable that they’re all the same size. It makes for a better looking finished product and helps during assembly. Pallet Selection. Pallets are made from all different types of wood. For a compost bin, it’s preferable to find those that are rot resistant, such as oak or cedar. Pine, although easy to find, does not stand up to the elements as long. For strength and durability, you can’t beat hardwood. 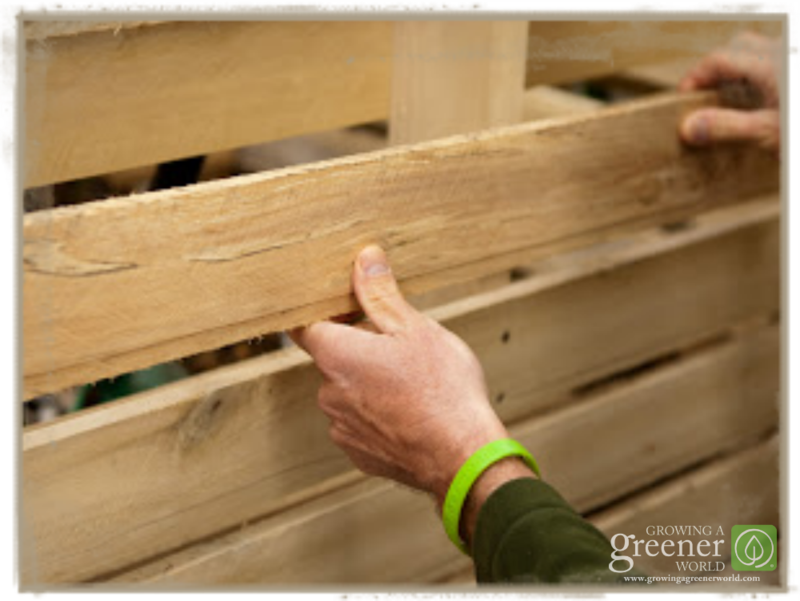 Most importantly, choose pallets that have not been chemically treated. The most common treatment methods for pests and pathogens are either heat-treating (marked on the pallet with “HT”) or fumigation, using Methyl Bromide (marked MB). Stick with heat-treated or new virgin wood if you can find it. Assembly. Assembly is straightforward and intuitive. All you need are some all-weather deck screws (I used 3-inch length) and a drill with the appropriate bit. That’s it! 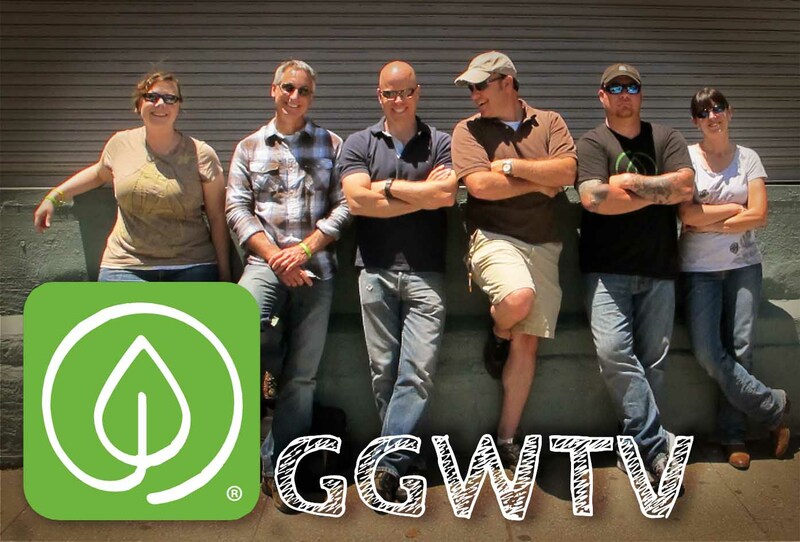 Here are the steps to make the three-bin pallet composting bin I built in Episode 225 of Growing a Greener World. 1. Start with a level surface for the area where your system will set and assemble it in place. For the three-bin composting system I built, you will need seven pallets: one for each outer wall, two for the dividers to separate the bins, and three across the back. 2. I first attached the left outer sidewall pallet to another pallet that would serve as part of the backside with several of the screws. 3. Next, add one of the inner pallets that will serve as a divider of each section. Secure it against the same (first) back pallet with several screws. 4. Add the middle pallet that will make up part of the backside. The dividing pallet mentioned above is what secured the back pallets in place. With the remaining four pallets, work your way across for the next two sections in this same manner. 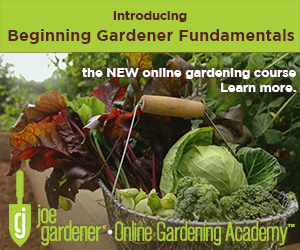 In no time, you are finished with the basic setup and ready to compost. The Options. The assembly was so fast and easy, I felt like I wanted to spiff mine up some more. Although totally unnecessary, I liked the idea of having a cover over the bin that would hold my finished compost. My improvised solution consisted of a cut-to-fit sheet of corrugated plastic screwed to a wooden frame made of 2×2 pine. I then attached two hinges to the fame and secured them to the outside of the back pallet. 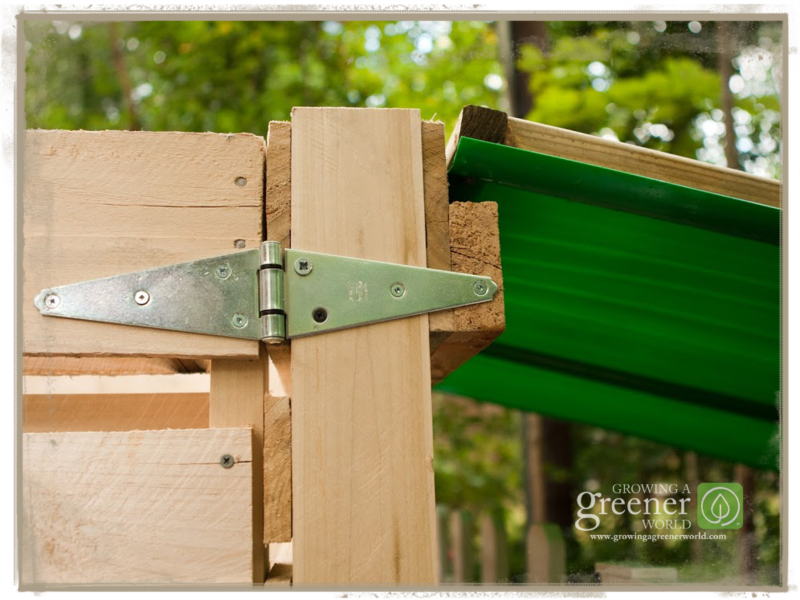 Two larger hinges were also used to attach the outside pallet wall of the finished compost section to the back pallet. My thinking was it would be a nice way to swing open that side so I had better access for retrieving compost. In hindsight, it’s a nice feature but it’s not necessary and more trouble than it’s worth. Consider grabbing an extra pallet to use just for additional parts. I removed the slats from it to place in between other slats of my finished bins wherever I wanted to close some of the gaps. 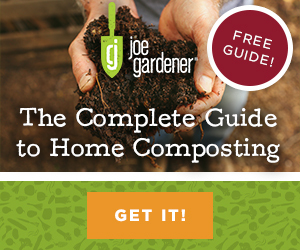 It’s a smart and simple fix to help keep more of your precious compost in place. A final step that I strongly suggest is to screw a long treated 2×4 across the backside of the pallet wall. The extra stability it provides is a simple and inexpensive option to reinforce the entire system. You can watch the composting episode and see just how I built this bin here. 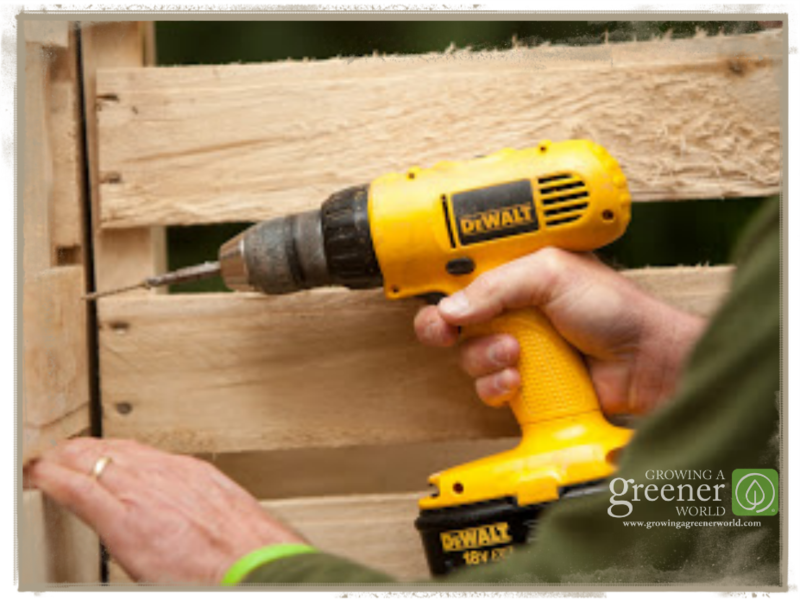 If you’re looking for another great use of pallets, check out our most popular post on the Step by Step Instructions for Building a Pallet Garden, including the how-to video here. Can you please tell me where you purchased your green shovel with tines? In your notes you suggest using a TREATED 2 x 4. Won’t this leach in? Since the treated 2×4 is on the outside of the bin and not in direct contact with the compost, I don’t consider this to be a concern Bob. Alternatively, you could use an untreated solid piece of hardwood or rot-resistant cedar for example. Thank you Joe for all the advice. Fortunately, I live on St. Thomas, US Virgin Islands, where we have year round growing, depending on what your growing. I’m preparing now for our “winter” growing season and because pallets are abundant here, I’m going that route for both raised gardens and for my compost. My biggest concern is keeping our island critters out of all of it, especially the iguanas and the pesty Thrushie bird. Any advice on a “green” way of doing this? Hi Laura. Luck you to live in such a beautiful place! While I don’t have advice on keeping our iguanas and Thrushies, my thoughts are to grow enough to share. While we don’t have the same pests here, we do have plenty others that want to help themselves to what we grown. A physical barrier is about the only solution I know that really works but they have their own risks and limitations. Mainly the risk of the animal getting caught or injured. Personally, I grow as much as I can, knowing that I’ll be sharing it with the wildlife around me. While not everyone has the luxury to grow enough to share, I’ve resigned myself to accept that as the best overall way to go rather than constantly fight it. Good luck Laura. With this method, how long does the composting process typically take regarding that you’re using mostly food waste and compostable paper? The speed at which your ingredients become compost still depends on moisture, air and the blend of green waste to brown. But, I use the pallet system for my compost and it breaks down impressively fast. For example, a new pile started in the fall here in Atlanta is usable compost the following spring. My temps of the decomposing ingredients get to almost 150 degrees using food scraps, coffee grounds and any plant debris. However, I think my secret weapon to really cooking the compost is fresh chicken manure. I add that about once a week and I’m sure it makes a big difference. Without chicken manure, I still think you can have usable compost from start to finish in about 6 – 12 months depending on where you live. 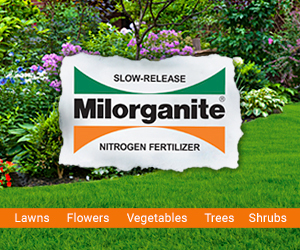 Great DIY project for my garden, it appears that even I can do this…Thanks for sharing your knowledge. One compost bin at a time will definitely save our planet. 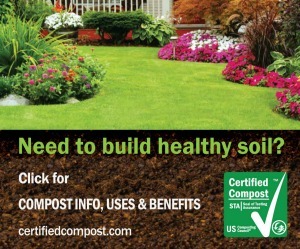 Hopefully many folks would start digging and composting. Many thanks for this article. JOE, what is your take on food scrap composting ? Also do you add worms to your compost piles? Rick, if you’re asking if I compost all my food scraps, the answer is yes, with the exception of meat and dairy. All remaining food scrap go in the composting bin. I don’t add worms but you could. In my experience, they eventually show up. As the compost is cooking, temperatures in my pile approach 150 degrees–not the ideal conditions for worms. If I were to add them, I’d do so in the garden beds rather than the compost. We love your ideas! Keep them coming. Some of the gardeners at “the allotments” are going to try the pallet garden – for herbs I think. And now you have given us another project! SUPER!! I seen your show for the first time today, and the things you have taught me today were priceless joe. really great great teacher. thanks a lot for your knowledge!!! your show is my gardening inspiration with growing my own food!! thanks again!! Thanks so much Michelle for these kind words. I’m so glad you found us and that you found our information so helpful! Hi Donna. I totally love the blogging world. It brings us all together into one shared community of like-minded people. So funny how people connect these days. Thanks for the good words and for taking the time to write. 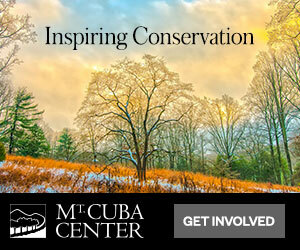 Keep up the good work and thank you for the work you do to provide Certified Organic products to all of us!